Can You Recommend a Good Wildlife Gardening Book? These are the topics National Wildlife covers in their book about gardening for four seasons. I have just the book for you from National Wildlife. "Wildlife Gardening, Tips for Four Seasons" is an excellent collection of seasonal gardening articles with lovely photographs and topical information. In addition to the interesting articles, they included side bar columns with tips for gardeners and lovely photographs. I was honored to be asked to include one of my photos in the edition under "gardening for change." 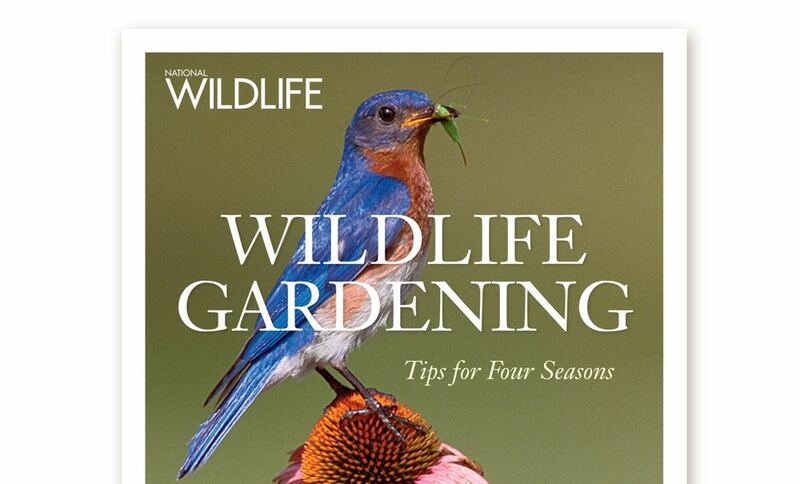 Price is $19.95, making "Wildlife Gardening, Tips for Four Seasons" a lovely gift that will keep on giving. You can purchase the book at the National Wildlife Federation online store. Let me know what your husband thinks of the book! Sorry but we cut off taking on projects to finish before Christmas by mid-September to make sure we can get them all done and delivered. You do have a couple of easy options to finish your gift quilt. If you are comfortable with your sewing machine, you can set up a simple quilt pattern and sew lines across your quilt before you sew on the binding. Another easier option is to hand “quilt” it by tying yarn. Pick up a yarn needle, a favorite yarn color or two and set up a grid for how far apart you will sew and tie the yarn pieces. We have a handmade quilt where the different yarn colors really add texture to the tied corduroy quilt. 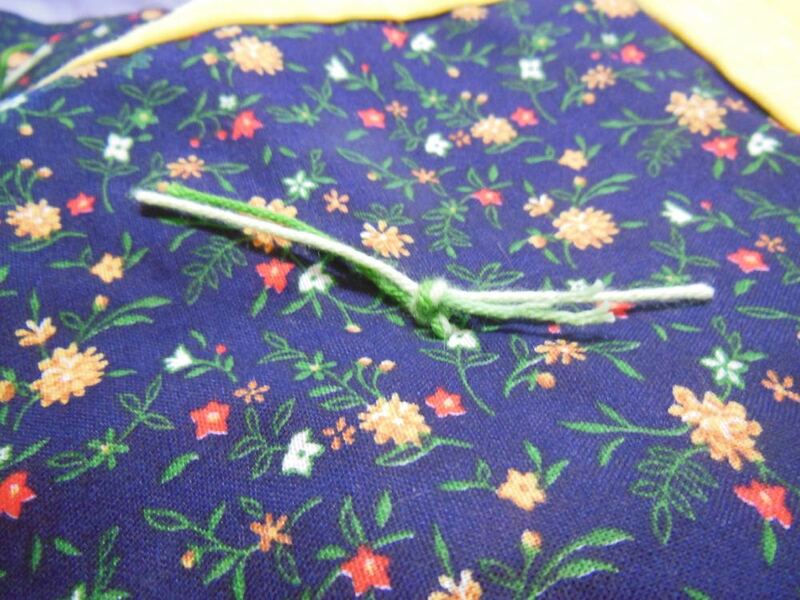 Many homemade quilts have been finished with this simple yarn tying technique over the years. You can still wash the quilt with the yarn ties so they do not limit quilt cleaning options. Hope this helps and good luck with your Christmas project! We have a guide to starting a quilt business to help beginning entrepreneurs like you, hope it helps. In terms of using other selling platforms like Etsy and Amazon, I have a specific reason for using only one of them. Since we custom design quilts, home decor and gifts, I didn’t want to give up my copyright for those patterns. 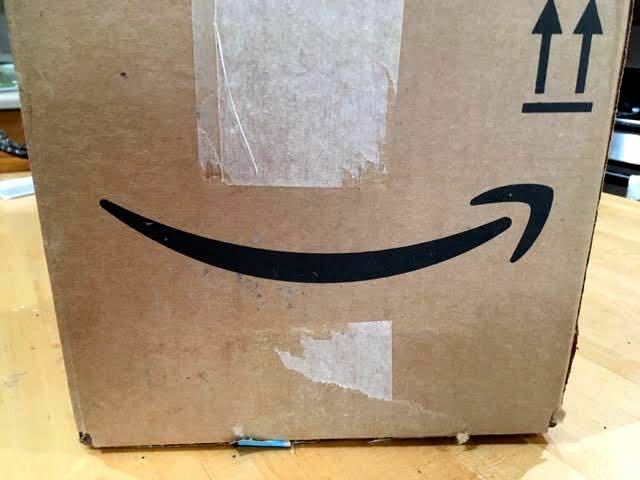 If you read the Amazon fine print agreement, they own the designs of whatever you sell on their platform. Etsy, on the other hand, lets participants maintain the rights to their designs and patterns and provides very helpful advice to someone starting a business. If Etsy had been around when I started Bluebird Gardens in 1998, I would have used their platform to market our custom products. If you have any other questions, please let me know and good luck in your business venture! Hi Mary, here's the collection of one of a kind, handmade Santa dolls we have in stock, no two are alike. 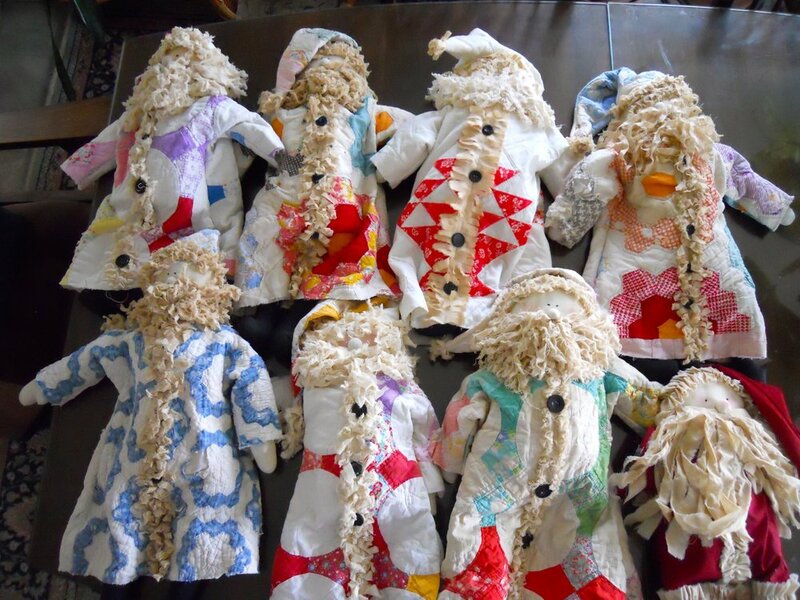 The handmade dolls are made out of cutter or remnant handmade quilts. These Santa dolls have several with flower garden quilts, one red and white flower basket quilt, a couple of circle quilts and one little doll in a worn red Santa Claus cotton outfit. Glad you enjoyed your visit to our website. That applique quilt is stunning and probably around $15,000 or more to make not counting the quilt design work. There are a lot of lovely details in the center and I agree with you, the border fabric takes away from the center design. If you have any other questions, please let me know. Happy New Year! This was a large red Poinsettia I received as a gift right before Christmas, it's more like a shrub. 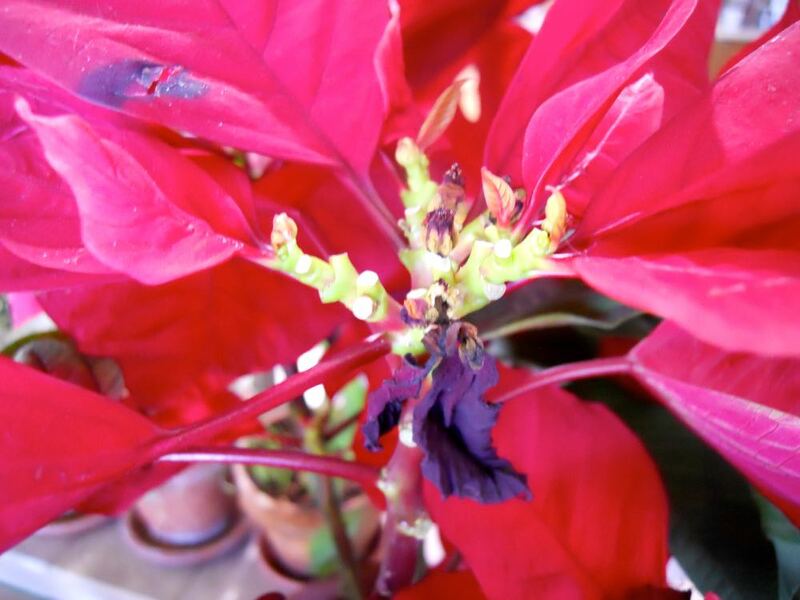 Lucky you, poinsettias are a wonderful Christmas gift and has become a holiday tradition. They are originally from Mexico, where they can grow the size of shrubs and small landscaping trees. Legend has it that two children heading for the manger didn't have any gifts for the Christ child so they picked some weeds from the side of the road. By the time they arrived at the manger, the weeds had turned into the lovely red Poinsettias we see for sale around December. 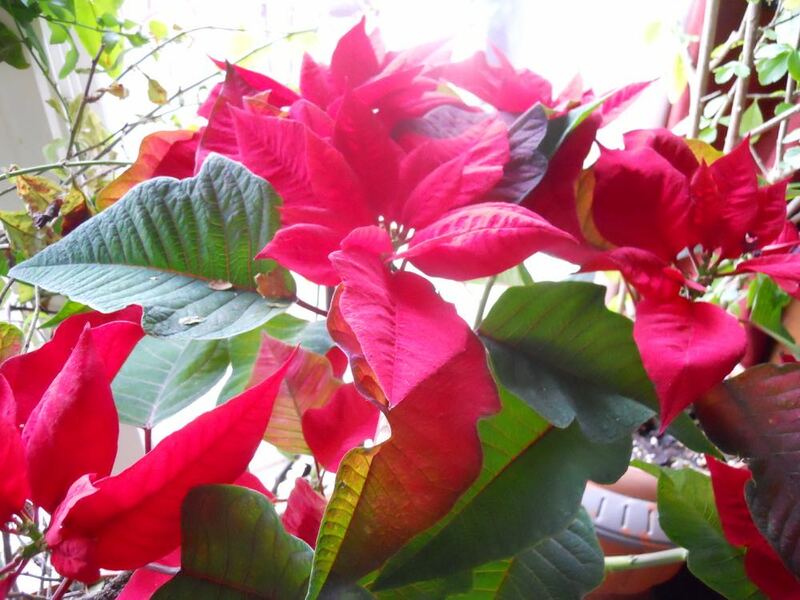 Poinsettias are relatively easy to grow once they have found a home. The reason I say that is that poinsettias are popular church and office decor, where they can easily be exposed to drafts, bad lighting conditions and poor watering. Those poinsettias need a little more tender loving care to get them settled in once you take them home. I bought these three white poinsettias for 89 cents each right after Christmas, still enjoying them! There are now a variety of different-colored Poinsettias on the market including white, yellow and the ever-popular peppermint, which I am told tends to sell out first. Poinsettia flowers are actually the little nibs on the inside of the leaves that have turned red. You may see some of the red, or in my case white, leaves falling off. That's natural. The flowers are actually tiny, located in the center, protected by the larger leaves that are now a red or white color. The key to caring for Poinsettias is to keep them evenly moist and away from drafts. I have mine in indirect light and check them every day to make sure the soil is not drying out. If you have African violets and moth orchids, those lighting conditions are similar to the ones Poinsettias need. If you need to find a different location, place the plants near a bright window, but not directly in the sunlight. Ideal temperatures would be between 60 and 68 degrees Fahrenheit. If the temperatures are kept above 75 degrees, the plants can decline quickly. Avoid overwatering, applying too much water can kill the roots of the plant. Wait until the surface of the potting soil begins to dry slightly before watering. Apply water until it begins to run out the bottom of the pot, wait 30 minutes, and then dump out the water that remains in the bottom of the drip tray. If you still have the plant in foil, remove it. Don’t worry if the plant drops all of the bracts, or leaves, and looks like the Charlie Brown Christmas tree after the holidays. Continue to water as needed until new growth forms. Near the middle of September, the poinsettia should be placed in complete darkness from 5 pm to 8 am daily. Put it under a cardboard box or in a dark closet to provide the “short day,” which encourages blooming. Lights from any lamps will prevent the bracts from changing color and for normal flowering. Continue this “short day” treatment until the plant bracts show color in late November. Don't forget to keep the plant watered during this dark period, it still needs moisture. Until then, enjoy these lovely plants, they will hold their red and white colors through February. I love having my white ones on my dining room table. 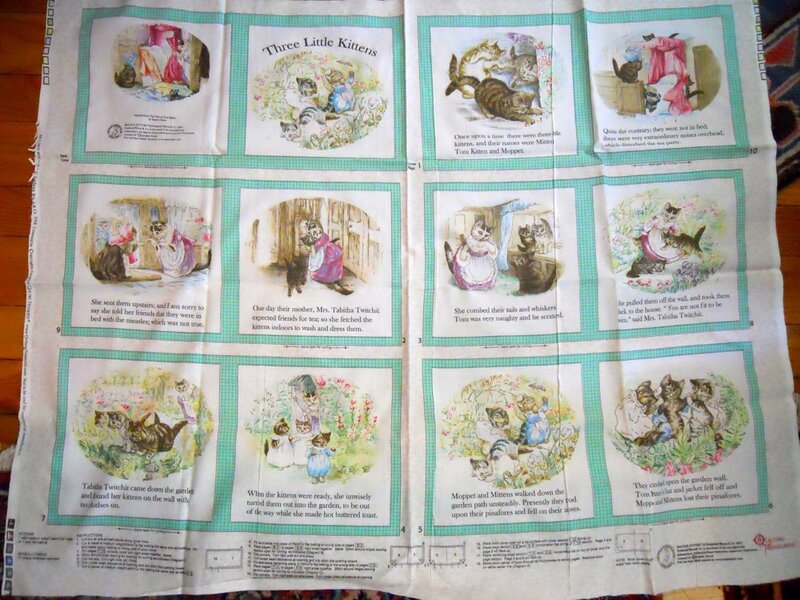 Here's one example of how a customer featured a quote in the corner of a quilt. There are several ways you can feature a personalized embroidered quote on a double wedding ring quilt. The key is to decide how important the quote is in relation to the couple's names and wedding dates. If the quote is something special to them, then I would place it in the center between their names in one quilt block and their wedding date in the opposite block, such as the photo example of one of our personalized Country Double Wedding Ring Quilt throws. Here is another personalized country double wedding ring quilt with a special quote. If you want to emphasize the couple's names, don't be afraid to place their name sin the center block and move the quote off to one side, just depends on what you want to make the focal point in the quilt. In terms of trends, our customers like to place the quote in the main center block and place the names in one side block, the wedding date in the other. A 12x12-inch crazy quilt block that can easily be made into an accent pillow. We certainly can help you finish this quilt for you. However, wouldn't you like to finish it yourself so you can present it to your Mom as a handmade quilt you made just for her? If you haven't discussed the quilt project with your Mom yet, take this opportunity to involve her in your project. If she is a quilter herself, she may appreciate discussing the project with you. Maybe you can ask her about the size of the handmade quilt she would like, the color of the quilt backing and binding, maybe even what kind of batting. Telling someone will also help keep you on task. Does your mother quilt? My mother was a great seamstress and to this day I can hear her in my mind giving me advice about something I am making. If you have only one block finished and don't want to continue, make it into a throw pillow. Personalize it with custom embroidery with your Mom's name and a favorite quote. Choose a backing that compliments her home decor so she can easily incorporate it in her home. What's Wrong with My Hanging Basket? Healthy hanging baskets grow slowly after being treated with compost at Bluebird Gardens. Hi Lisa, it's easy to over-fertilize plants, especially those in hanging baskets. They do grow quickly with fertilizers but once the fertilizer moves through the soil, nothing is left to sustain the plants and they die. The hanging basket in the photo is the standard 12-inch hanging pot that gets treated with a good addition of compost before I add anything. The little limp start at the front will root in a couple of days and, with the help of rain water showers, this little hanging basket will have a happy summer. Growth, however, will be slow, keeping pace with the available space in the hanging basket. When the baskets get too full, I will trim them back and give them another amendment of compost. Actually, this hanging basket spends all four seasons with me, wintering over inside and then getting placed outdoors for most of the growing season. I think I have had this hanging basket a good 5-6 years so keeping the soil happy is the key to successfully keeping hanging baskets alive. When these hanging baskets get over-stimulated with too much fertilizer, especially the soluble blue kind, these baskets don't have enough nutrients in their limited soil to sustain growth. My advice is only to buy hanging baskets with plant starts and allow them to grow into the available space. If you want a full hanging basket, know that they got that way by growing fast. Buy it for your event, then afterwards if you want to try to salvage it, remove the plants and soil; add new soil with compost and hope the plants establish themselves in their new growing medium. How to Keep My Roses Fresh? This bouquet of red roses is ready for delivery on Valentine's Day at our local florist. Some gift red roses are delivered cut in boxes with stems in water in small water containers. If they were in a box, get a vase and make sure to wash it with hot water and dishwashing detergent, rinse and dry, then fill vase 3/4 full with room temperature water. Add a penny to water to help keep bacteria from growing. I have also used half an aspirin. Most florists also provide floral flood packets. Don't save them, use them! Add the florist food packet, mix, then add the remaining roses. On a personal note, keep the flowers where you spend the most of your time so you can enjoy them. Even though they may appear beautiful one day, room conditions may change and speed up their fading process so don't take them for granted. Enjoy! Paperwhite narcissus bulbs are a popular holiday gift and very fragrant when in bloom. Mary, there’s nothing quite as fragrant, or suggestive of spring, as a little stash of blooming paperwhite narcissus, what a nice gift. Depending on how big the bulbs are, you might be able to save the bulbs by planting them outside after they bloom. It may take a few years before they build up energy back in the bulbs to re-bloom so don't get discouraged. Since most paperwhite narcissus are promoted as gifts mid-winter, the ground in Missouri is usually too hard to even dig to plant them. In that case, best to compost them. The bulbs will be exhausted from blooming and unless you are willing to baby them until spring, chances are they won't make it. If you want to try to keep them going, keep them watered and in a sunny window while they produce green leaves. Fertilize them with 1/4 to 1/2 the recommended fertilizer dosage. The leaves will store energy in the bulb so that when you plant them in the ground after the danger of frost is over, they may come back. I think it's worth a try but there are no guarantees. Good luck! What Do You Recommend for a Jewelry Gift? Hi Joe, that's easy, give her a nice string of pearls, a set of pearl earrings, a ring with pearls or a vintage pearl pin. I like pins because I can use them on a blouse, sweater, coat or hat. Pearls are a reminder that life's aggravations can become a thing of beauty. The beautiful result of nature’s design, a pearl is generated by one irritating grain of sand. Just as pearls come in a variety of shapes, sizes, and colors, so do life's trials. We create our own beauty from the tragedies of our lives but often do not see it. Pearls are a nice way to remind someone of what is beautiful in life. Pink sleeping cats throw makes a good gift for cat-loving girls. Hi Alice, it can be challenging to buy quilts when you don't know the bed size but you have other options if you like the idea of giving something quilted. Start by making a list of some of your family members hobbies and interests, then look at lap quilts, also called throws. These smaller versions of quilts are perfect to curl up in and can nicely add color to a room by throwing them over the back of a chair or sofa. They are usually 50x60-inches and also can be used as a wall hanging. If you are not sure of hobbies, do your family members have pets? Dog and cat throws have been customer favorites for gifts for all sorts of occasions, including birthdays, anniversaries and Christmas. Still not sure? Gift certificates are always a convenient choice, then add a card that says you and the gift recipient can have fun shopping online after the holidays for something that you both will like. What Do You Recommend for a Wedding Gift? Charlotte: Lucky you to have both in a couple loving to be outdoors, usually this question is about one person loving the outdoors and the other one scared to death of anything that moves. Our customer's favorite wedding gift is a traditional double wedding ring quilt, either in a throw size or a bedspread size. Our made in USA double wedding ring throws are oversized - we call it snuggle size - so two people can comfortably curl up with it. If the groom is tall, think about getting a twin size quilt for a nap quilt. 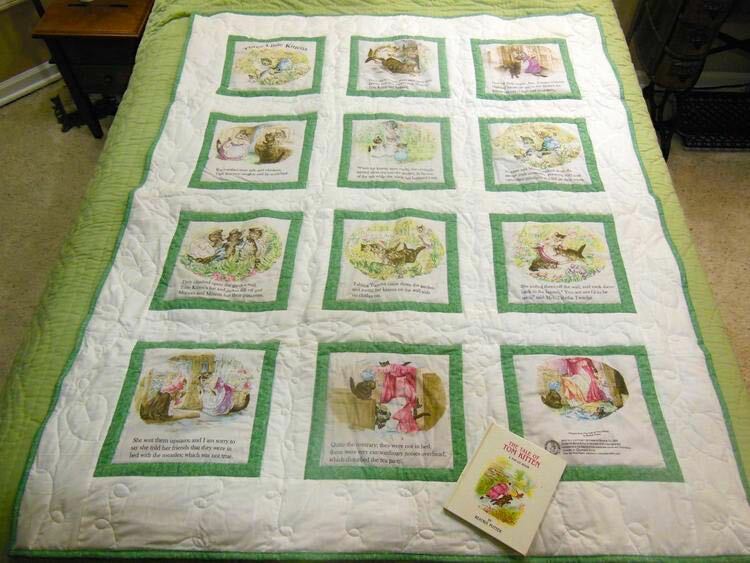 The extra length will make sure his toes are covered, such as this Vintage Lime Double Wedding Ring Twin Quilt. The best selling of all of our double wedding ring quilts is our Country Double Wedding Ring Quilt. The fabrics can fit into most bedroom colors. The second most popular double wedding ring quilt is a blue one, a testament to blue still being a favorite master bedroom color. Regardless of what quilt you choose, custom embroider their names and wedding dates to make your gift extra special. Personalize your quilt of choice with custom embroidery of the couple's name and wedding date. Some of our customers just add the first names and dates, others include the last name and even more add a favorite quote, Bible verse or saying. You are only limited by what you can imagine doing! What Is Your Source for Made in USA Quilts? Our custom sleeping cats quilts and shams are proudly made here in USA. Charlotte: Thanks, Linda, glad you enjoy the blogs. You will always be welcome to visit my garden. Our made in USA quilts are primarily made in Missouri. We have a couple of quilters in other states who make specialized custom quilts but all of the quilts certified as made in USA are - well, made in the United States of America. To make sure our customers know what they are buying, we designate in the quilt descriptions whether the quilt is made in USA or imported. They also get a certificate card with a care guide and custom quilt details. One of our customers favorite custom quilts is this Ten Inch Squares Custom Quilt we pare with Sleeping Cats custom shams. In terms of our imported quilts, we only offer imported quilts that we give, and would want to give, as gifts ourselves. The same concept applies to our baby quilts, throws and quilted wall hangings. Each one of our made in USA quilts are designated as such and certified as being made in USA. Charlotte: Hi Lecia, we will be delighted to help you with customized quilt blocks for your handmade customized throw. In terms of pricing, we start with 1/2 inch letters for 50 cents each up to $4.75 cents for 4.75-inch letters. Here's the final custom embroidered quilt block we made for Lecia. Thanks, Lecia! Native Black eye susans are long-lasting cut flowers and are one of my favorite summer flowers. Charlotte: Some people shop; I go out into my garden. Whether it is something to celebrate a special day, or moment, or cheer someone up, I can usually find something on my one-acre Missouri hillside garden. It's not always flowers but those aren't a bad choice. Flowers are always welcome, especially ones we have "grown ourselves." My garden also inspires me in terms of colors. Nature in a garden has a way of blending colors beautifully, a wonder place to be inspired when stumped selecting quilt fabrics. I also enjoy my garden for all of the living creatures it hosts. Now when I look at a flower, I also look for its tenant, whether a spider or frog or ladybug. If I'm lucky, it's one of my honeybees visiting to pick up pollen. I sometimes stop for a minute. That is all it takes for some scene to unfold right before my camera eyes, if I'm lucky enough to remember to take my camera. Now I try to have it in hand at all times; I don't want to miss what my certified wildlife garden and monarch way station has to offer. So what else can you get inspired to do? Let's see, a jar of fresh herbs is a wonderful gift for a cook; a plant start is always welcome to a gardening friend. I will also share recipes to make gifts from the garden, and I look forward to hearing about the garden gifts you make. What kind of gifts do you like to give from your garden?